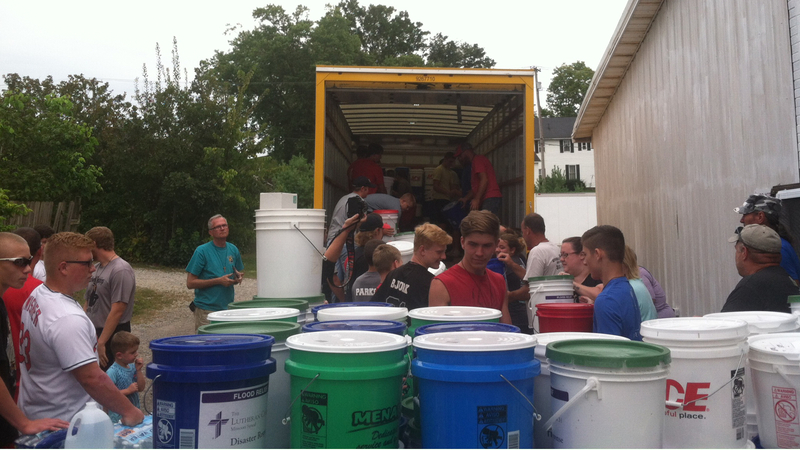 Flood buckets, cleaning supplies, bottled water, and many other emergency supplies were loaded Monday, August 28, 2017, for delivery to Texas for Hurricane Harvey relief. If you would like to make flood buckets or contribute other materials, click here for a list of flood bucket components and critically needed items. Any congregations who can drop-ship their donations directly to the congregations staging donations (listed below) are encouraged to do so. A projected 12 million people have been impacted by this category 4 hurricane. Twenty-eight people have died and thousands are stranded due to Houston’s catastrophic flooding. No drinking water, no electricity, and no food have created life-threatening conditions. NALC and the HARP Mission volunteers are providing the manpower to help hundreds of these families. The HARP Mission serves southeast Ohio in non-disaster times, providing material goods, home repairs, and job training to low income families. When a disaster strikes, NALC volunteers are ready to ship emergency supplies from the national warehouse in Caldwell. These are items that are not easily available in impacted communities. To support Hurricane Harvey relief efforts, send your monetary donations to NALC Disaster Response, 2299 Palmer Dr. Suite 220 New Brighton, MN 55112 — or securely donate online by clicking the button below. Be sure to click “Disaster Response Fund” on the donation page. Call Mary Bates at 740-509-1132 for more information or to donate material goods, such as bottled water. Please keep these families in your prayers.